Piano Pieces - Volume 1 (Earlier Works). Composed by Wolfgang Amadeus Mozart (1756-1791). Edited by Ulrich Leisinger. For piano. Classic. SMP Level 7 (Late Intermediate). Full score. Standard notation. 176 pages. Published by Wiener Urtext/Vienna Urtext (PR.UT050229).ISBN 978-3-85055-642-2. With Standard notation. Classic.As early as the age of four, Mozart amazed his father with his quickness of mind as regards piano-playing. The first works are easy dance movements by the five-year-old who developed with extraordinary speed. During his lifetime, he created several piano pieces, apart from the sonatas and variations. The pieces from his youth, most of them written down in the music book for Maria Anna Mozart and in the so-called London sketch book, are mostly short dance movements, but there already are lengthy individual movements as well. From the mid-1770s, there mainly are larger individual works, including fantasias and rondos which can stand up as equals to the sonatas and variations of the Viennese period. 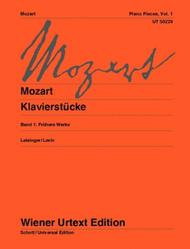 Volume 1 contains the pieces from his youth (among them see Nannerl music book and the London scetch book) which are excellently suited for elementary teaching; they constitute a varied repertoire of alternatives to the few frequently played piano pieces by young Mozart which, of course, are contained in this volume as well.This title has selections that range in difficulty from SMP Level 6-7.About SMP Level 7 (Late Intermediate)4 to 5-note chords in both hands and scales in octaves in both hands.